Thomas Anderson is a computer programmer who maintains a double life as the hacker "Neo". He is driven to learn the meaning of cryptic references to "the Matrix" appearing on his computer. Infamous hacker Trinity contacts Neo and informs him that a man named Morpheus can tell him what the Matrix is; however, three Agents, led by Agent Smith, arrest Neo to prevent him from collaborating with Morpheus. Undeterred, Neo meets with Morpheus and confirms that he wants to learn more about the Matrix by choosing an offered red pill. After swallowing the pill, Neo abruptly awakens in a liquid-filled vessel, connected along with millions of other people to an elaborate electrical structure. He is rescued by Morpheus and brought aboard a levitating ship, the Nebuchadnezzar. Morpheus tells Neo that humans are fighting against intelligent machines that were created in the 21st century and have since taken control of the Earth's surface. Humans polluted the sky to cut off the machines' solar power, but the machines adapted to using human bioelectricity as a power source. Enslaved humans are kept docile within the "Matrix" – a simulation of the world as it was in 1999. Neo has lived in this simulated world since birth; in reality, the year is closer to 2199. Morpheus explains that he and his crew belong to a group of free humans who "unplug" others from the Matrix and recruit them to their rebellion against the Machines. They can hack into the Matrix and re-enter the simulated reality, where their understanding of its true nature allows them to manipulate its physical laws, granting them superhuman abilities. Neo undergoes virtual combat training. He is warned that fatal injuries within the Matrix will also kill one's physical body, and that the Agents he encountered are powerful sentient programs that patrol the Matrix and eliminate threats to the system. 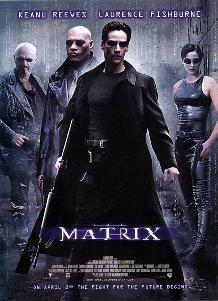 Morpheus believes Neo is "the One", a man prophesied to end the war between humans and machines.